Colorectal carcinomas (CRC) carry massive genetic and transcriptional alterations that influence multiple cellular pathways. The study of proteins whose loss-of-function (LOF) alters the growth of CRC cells can be used to further understand the cellular processes cancer cells depend upon for survival. A small-scale RNAi screen of ~400 genes conducted in SW480 CRC cells identified several candidate genes as required for the viability of CRC cells, most prominently CASP8AP2/FLASH. To understand the function of this gene in maintaining the viability of CRC cells in an unbiased manner, we generated gene specific expression profiles following RNAi. Silencing of CASP8AP2/FLASH resulted in altered expression of over 2500 genes enriched for genes associated with cellular growth and proliferation. Loss of CASP8AP2/FLASH function was significantly associated with altered transcription of the genes encoding the replication-dependent histone proteins as a result of the expression of the non-canonical polyA variants of these transcripts. Silencing of CASP8AP2/FLASH also mediated enrichment of changes in the expression of targets of the NFκB and MYC transcription factors. These findings were confirmed by whole transcriptome analysis of CASP8AP2/FLASH silenced cells at multiple time points. Finally, we identified and validated that CASP8AP2/FLASH LOF increases the expression of neurofilament heavy polypeptide (NEFH), a protein recently linked to regulation of the AKT1/ß-catenin pathway. We have used unbiased RNAi based approaches to identify and characterize the function of CASP8AP2/FLASH, a protein not previously reported as required for cell survival. 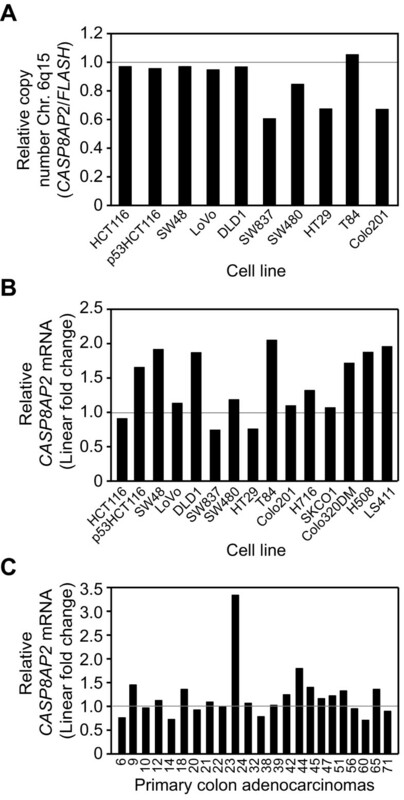 This study further defines the role CASP8AP2/FLASH plays in the regulating expression of the replication-dependent histones and shows that its LOF results in broad and reproducible effects on the transcriptome of colorectal cancer cells including the induction of expression of the recently described tumor suppressor gene NEFH. Cancer cells are characterized by changes in proteins that favor cell survival and proliferation, including down-regulation or de-activation of pro-apoptotic factors and cell cycle regulators, and up-regulation or activation of anti-apoptotic factors including kinases and growth factors. Targeting of specific proteins to overcome or bypass this suppression of cell death and enhancement of proliferation is a major approach for the development of anti-cancer therapies. Like all cancers, colorectal cancer is marked by genomic aberrations and transcriptional deregulation that affect multiple cellular pathways . The characterization of proteins whose function alters the underlying molecular features of CRC has the potential to identify new therapeutic strategies for CRC. Gene-specific loss-of-function (LOF) analysis, through the application of RNA interference (RNAi) based technologies, is increasingly being used to probe the role of a particular protein in a specific cellular context . We have recently used RNAi based LOF approaches to validate the functional dependence of colorectal cancer cells on genes identified as over-expressed in CRC . Loss-of-function analysis via RNAi can also be used to identify proteins required for the survival of CRC cells that show no significant genomic or transcriptional changes. Alterations in apoptosis and related survival mechanisms contribute to both the development of CRC, and the response to treatment . For example, colorectal tumors often show increased expression of members of the anti-apoptotic BCL family including BCL2, mutations in the tumor suppressor TP53, and defects in several pathways related to inflammation including the COX2, TGF-ß, and NFκB pathways. It is likely that many less well-characterized proteins related to cell survival alter the growth of CRC cells. Identification of such genes could though give further insight into the molecular changes underlying CRC, and thus the development of new treatment strategies. To assess the feasibility of identifying proteins whose function has not previously been identified as essential for the survival of colorectal cancer cells we conducted a small-scale RNAi screen of ~400 genes in CRC cells. The gene targets were focused on proteins associated with cell survival, with an emphasis on regulators, and effectors of apoptosis. One of the candidate genes most prominently required for the survival of CRC cells was the gene encoding Caspase-8-Associated Protein 2 or FLICE-associated Huge Protein (CASP8AP2/FLASH). Subsequent whole transcriptome profiling showed that CASP8AP2/FLASH LOF has wide-ranging, and specific, effects on gene expression including deregulated expression of the replication-dependent histone genes. SW480 (an aneuploid, mismatch-repair proficient, colon adenocarcinoma cell line), SW837 (an aneuploid, mismatch repair proficient, rectal adenocarcinoma cell line), and SW48 (a mismatch-repair deficient, diploid, colon adenocarcinoma cell line) cells were obtained from ATCC (Manassas, VA) and were maintained in RPMI (Invitrogen, Carlsbad, CA) containing 10% fetal bovine serum (FBS, Invitrogen), supplemented with L-Glutamine and penicillin/streptomycin, at 37°C in a humidified atmosphere containing 5% CO2. Cells were passaged every four to five days. The choice of SW480 as the cell line for the RNAi screen was based on characteristics of the spectral karyotype that recapitulate chromosomal aberrations commonly observed in colorectal cancer . The synthetic siRNA based RNAi screen was performed using the Human Apoptosis Set Library (Qiagen, Valencia, CA) arrayed in a total of eleven 96 well plates, one siRNA per well. Gene targets were selected based on searches of the PANTHER (Protein ANalysis THrough Evolutionary Relationships) Classification System, the Gene Ontology database, and PubMed resources (E. Lader, Qiagen, Personnel communication). See Additional file 1, Table S1 for list of genes targeted and siRNA target sequences. Genes targeted included known regulators and effectors of apoptosis, proteins with less defined functions in cell survival and apoptosis and a few proteins with no known direct function linked to apoptosis so all functional groups were represented. We have previously determined successful transfection conditions of siRNAs into SW480 cells using the Oligofectamine transfection reagent (Invitrogen) . We confirmed these conditions for this study by examining the silencing of the CTNNB1 gene at an mRNA level (Additional file 2, Figure S1A) and the viability of SW480 cells following silencing of Polo-like kinase 1 (PLK1) (Additional file 2, Figure S1B). The RNAi screen was conducted as follows; transfections were performed by pre-complexing siRNA (2 pmol) with 0.6 μl Oligofectamine lipid transfection reagent (Invitrogen) in 50 μL of serum free RPMI in individual plate wells for 30 min at ambient temperature. Next, SW480 cells (7,000) were added in 50 μL RPMI supplemented with 20% FBS to yield a final concentration of 20 nM siRNA in RPMI, 10% FBS. This final mixture was incubated at ambient temperature for 1 hour before being placed at 37°C in a humidified atmosphere containing 5% CO2. After 72 hours cell viability was assayed (Cell Titer Blue Reagent, Promega, Madison, WI). As this was a relatively small-scale siRNA screen, the viability of SW480 cells following siRNA transfection was expressed relative to the average viability for cells transfected with a negative control siRNA - AllStar Negative Control siRNA (siNeg) (Qiagen Inc.) (n = 33) (Additional file 2, Figure S1C). A siRNA corresponding to PLK1 was used as a positive control on every plate (see Additional file 3, Table S2 for sequence); on average this induced a decrease in the viability of SW480 cells of greater than 85% (n = 11) (Additional file 2, Figure S1C). For gene specific analysis SW480, SW48, and SW837 cells were transfected in 96 well plates as above using 15,000 SW48 cells, 10,000 SW837 cells, and 5,000 SW480 cells per well. See Additional file 3, Table S2 for the sequences of gene specific siRNAs. Transfections for whole transcriptome analysis were performed in triplicate in 6-well plates, using 2.1 × 105 SW480 cells and 1.8 μL Oligofectamine per well. Total RNA was isolated from cells using the RNeasy Mini kit (Qiagen) and mRNA reverse transcribed into cDNA using random hexamer primers or oligo dT and reverse transcriptase (Invitrogen SuperScriptIII). Gene expression levels for CASP8AP2/FLASH and NUP62 were assayed by quantitative reverse transcription-PCR (qRT-PCR) using Power SYBR Green technology (Applied Biosystems, Inc., Foster City, CA) and were normalized to the expression of YWHAZ. For each RT-PCR reaction, 300 ng cDNA was used. PCR was performed using default variables of the Applied Biosystems' Prism 7000 sequence detector, except for a total reaction volume of 25 μL. Primers were obtained from Operon Technologies, Inc. (Huntsville, AL) or Invitrogen. Gene expression levels for HIST1H2BD were determined by oligo-dT or random hexamer primed synthesis of cDNA (Invitrogen), and real-time PCR amplification in i-cycler (Bio-Rad) based conditions with SYBR green. HIST1H2BD expression levels were normalized to the expression of ß-actin. See Additional file 4, Table S3 for all primer sequences. Quantigene Probes (Panomics, Fremont, CA) corresponding to CASP8AP2/FLASH were used to directly measure gene specific mRNA levels (normalized to human cyclophilin B (PPIB) expression) in cell lysates as previously described . RNA samples were quantified and assessed for quality on a Bioanalyzer (Agilent, Santa Clara, CA) and only samples with an RIN value > 8 were hybridized. For microarray analysis, 700 ng RNA was converted to cRNA using an oligo dT primer, labeled with Cy3, and subjected to mono-channel hybridization onto a 4 × 44K Whole Human Genome Microarray per the manufacturers instructions (Agilent). Microarrays were washed and processed using an Agilent G2565BA scanner. Data were quality controlled and extracted using Agilent Technologies' Feature Extraction (version 9.1). Microarray expression data are available at the Gene Expression Omnibus (GEO) accession GSE29405 and are in accordance with MIAME guidelines. The array comparative genomic hybridization (CGH) and transcriptome analysis of primary colon adenocarcinoma tumors and cell lines has been previously described [6, 7]. The activation of Caspase 8 and Caspase 3/7 were measured using an Ac-LETD-pNA caspase-8 substrate (Caspase-Glo 8 Assay, Promega) and a DEVD peptide substrate (Caspase-Glo 3/7 Assay, Promega) respectively, following the manufacturers instructions. Plates were measured with a Victor luminometer (Perkin Elmer) at 60 min after addition of the Caspase 8 reagents and 90 min after the addition of the Caspase 3/7 reagents. Transfections for Western blot analyses were performed in 6-well plates, using 1.8 × 105 SW480 cells and 10.5 μL RNAiMax per well. Whole cell lysates were harvested from SW480 cells 72 hours post transfection with siCASP8AP2.3 and siCASP8AP2.6 according to the Complete Lysis-M Reagent Kit (Roche, Indianapolis, IN). 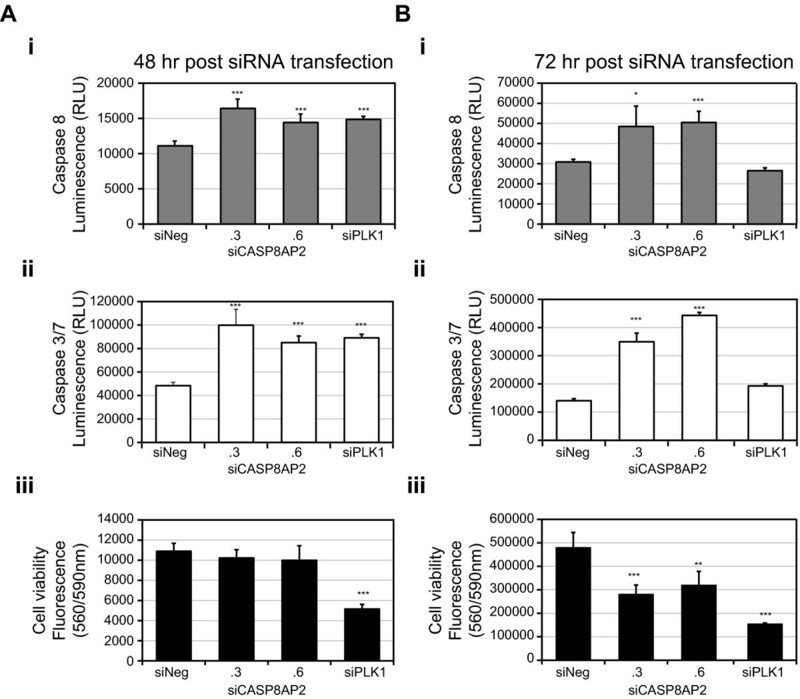 Reduction of CASP8AP2/FLASH mRNA was assessed by RT-PCR from replicate samples. Soluble protein fractions were run on a 10% SDS-PAGE gel and transferred to nitrocellulose membrane for 1 hour at 12 V with an additional 30 minutes at 24 V. The membrane was incubated with α-actin clone C4 (1:1000 dilution) (Millipore, Temecula, CA) and α-200 kD Neurofilament Heavy - Neuronal Marker (1:1000 dilution) (Abcam, Cambridge, MA) in 10% milk buffer in 1× PBS on a rocking platform overnight at 4 degrees. The membrane was washed 3 times for 10 minutes in 10% milk buffer in 1× PBS and incubated with HRP α-mouse (1:10,000 dilution) (Jackson ImmunoResearch, West Grove, PA) for 1 hour on a rocking platform at room temperature. The membrane was washed as before, rinsed with DI water and incubated with SuperSignal West Pico Chemiluminescent Substrate (Pierce/Thermo Fisher Scientific Rockford, IL) according the protocol. Kodak BioMax Light Film (Carestream Health, Woodbridge, CT) was used to expose the membrane for varying amounts of time. Standard statistical analyses were conducted in Excel. Comparisons of functional effects of gene silencing were assessed using the t-test (unequal variance); a p value of ≤0.05 was considered significant. Comparison of the fold change in different gene expression data sets was assessed using a Pearson's correlation. Gene expression array signal intensities were Log2 transformed and quantile normalized using the R statistical computing software and the package Limma. Differential expression between groups was assessed using an empirical Bayes method for the moderated T-statistics; all probes were corrected for multiple testing using Benjamini and Hochberg's false discovery rate (FDR) [8–11]. In order to be considered differentially expressed, probes had to have an average Log2 fold change of ± 0.6 (approximately 1.5 fold change on a linear scale) and a q-value (FDR) < 0.05. In addition, probes needed to show this significant fold change in the same direction for both siRNAs targeting CASP8AP2/FLASH in the initial analysis and for all three siRNAs in the follow up study. The time course study also included a comparison of siNeg transfected cells and untransfected cells. Any probes showing a significant differential expression (q-value < 0.05) in the siNeg cells versus untransfected SW480 cells were filtered from data used for analysis of gene ontologies, pathway analysis and gene set enrichment analysis. Of the ~44,000 probes examined this resulted in the removal of just 124 probes from the 24-hour data set, 820 probes at 48 hours, and ~1500 probes at 72 hours. To determine if any genes exhibiting decreased expression represented interactions between the transfected siRNA and non-targeted transcripts, we assessed the alignment of each siRNA sequence with the 3'UTR sequence of all of the downregulated genes obtained following transfection of each siRNA. The open-access miRanda application http://www.microrna.org was used to perform alignment predictions between each siRNA sequence and the 3'UTR sequence for all genes that showed decreased expression with each siRNA. We then examined in detail the non-targeted genes that were downregulated by two or more siRNAs that showed a potential miRNA-like mismatch alignment with a sequence within the 3'UTR of the non-targeted gene. One-way hierarchical clustering (average linkage) of the gene profiles was conducted on the expression data using JMP 8.0 (SAS, Cary, NC). The sequences of the 60 nucleotide probes (Agilent) annotated as corresponding to 79 human histone genes were all reassessed for alignment to the current RNA reference sequence (refseq_rna) database using nBLAST (Megablast, optimized for highly similar sequences) to confirm specificity and annotation. As described in Gertz et al., we confirmed high quality alignments between a probe and a gene as requiring a BLAST score of at least 100 bits . Most probes corresponded to unique histone transcripts and returned scores of 111 bits (the maximum score). Where a probe alignment of 111 bits was returned for more than one gene the annotation was altered to reflect both loci. Probe alignments to genes other than the principal target gene that returned scores of between 100 and 110 bits are noted in Table 1. Probes that did not align to a current RNA reference sequence, but were associated with a significant fold changes in expression, were also aligned against the entire NCBI nucleotide collection; the cDNA clones corresponding to these probes are noted in Table 1. Data corresponding to probes sequences that aligned to transcripts now annotated as a pseudogene were excluded. Differentially expressed genes (see criteria above) were analyzed through the use of IPA (Ingenuity® Systems, http://www.ingenuity.com). Each dataset was divided into up- and downregulated genes respectively, and then was subjected to gene function (gene ontology) analysis. Enrichment of functional groups within gene sets was calculated using a one-tailed Fisher's exact test. Functional groups with a Benjamini-Hochberg (B-H) corrected p-value of < 0.05 were considered significant. Knowledge-based gene networks were also generated using IPA tools. A maximum network size of 70 molecules was used. In order to condense datasets for Gene Set Enrichment Analysis , the median value of each probe (using all siRNA transfections) was normalized to the median value of the same probe in the mock transfections (siNeg). When two or more probes mapped to a single gene, the median normalized expression value was taken so that each gene mapped to a single expression value. GSEA was run using default parameters http://www.broadinstitute.org/gsea/index.jsp. The resulting landscape plots were analyzed for peaks in the tails of the ranked gene lists. FDR q-values < 0.05 were considered significant. Transcription factor target gene lists were derived from ChIP-Chip, ChiP-PET, or ChIP-seq data curated from peer-reviewed literature (Additional file 5, Table S4). In certain instances, other biological assays and techniques such as gene expression and quantitative ChIP were used in conjunction with ChIP-Chip, ChIP-PET, or ChIP-Seq in order to derive higher-confidence lists. NFκB target genes were taken from http://www.bu.edu/nf-kb/gene-resources/target-genes/ (complied December 2009), which is a compilation of downstream NFkB targets reported in peer-reviewed literature. All gene lists were cross-referenced to the Ingenuity Knowledge Base as well as NCBI Entrez Gene. Genes that could not be mapped to these databases by their published or associated identifiers were excluded. A siRNA based RNAi screen of 405 genes (two siRNAs/gene), most with annotated functions that include a role related to apoptosis, was conducted in the colorectal cancer (CRC) cell line SW480 (see Additional file 2, Figure S1D for a summary of the screen and Additional file 1, Table S1 for details of genes targeted and the relative cell viability of SW480 cells following RNAi normalized to siNegative control transfected cells). The aim of this screen was to identify genes not previously recognized as required for the survival of CRC cells. The two siRNAs corresponding to 45 genes both induced at least a 25% decrease in cell viability 72 hours post siRNA transfection (Additional file 2, Figure S1E). Of these 45 genes we selected 15 genes that represented a range of reduced viability seen in the initial screen for confirmation using the same siRNAs but with transfections conducted in triplicate (Additional file 2, Figure S1F). These 15 genes included BIRC5 (Survivin), silencing of which would be expected to induce a significant effect on the growth of SW480 cells  and proliferating cell nuclear antigen (PCNA), an essential protein required for DNA replication. Of the 15 genes followed up here, both siRNAs corresponding to five genes, CASP8AP2/FLASH, NUP62, NTRK1, WDR3, and TRAF1 reproducibly reduced cell viability by over 50%, levels either comparable or more than that seen following silencing of BIRC5/ Survivin and PCNA (Additional file 2, Figure S1F). At least one further siRNA corresponding to each of these fives genes was then assessed to confirm the phenotypic effects seen with the siRNAs used in the initial screen (Figure 1A). The silencing of CASP8AP2/FLASH and NUP62 showing the most consistent effect; an average of 60% reduction in viability was observed in CASP8AP2/FLASH silenced cells, and an average of 50% reduction in viability was seen in NUP62 silenced cells. The numerical values associated with the relative viability of the screens fluctuated slightly, reflecting natural variation in the biological replicate populations of cells and other subtle experimental factors, however, in every screen conducted, the reduction of CASP8AP2/FLASH consistently produced a substantial reduction in viability. The effect of silencing CASP8AP2/FLASH and NUP62 on cell viability was further enhanced when viability was assayed up to 144 hours post siRNA transfection (Figure 1B). We confirmed the silencing of CASP8AP2/FLASH and NUP62 RNA following RNAi by qRT-PCR (Figure 1C and 1D) and a reduction in viability in two further CRC cell lines. Both siRNAs corresponding to CASP8AP2/FLASH reduced the viability of SW837 and SW48 cells, though only one siRNA corresponding to NUP62 induced a reduction in the viability of SW837 and SW48 cells (Figure 1C and 1D). 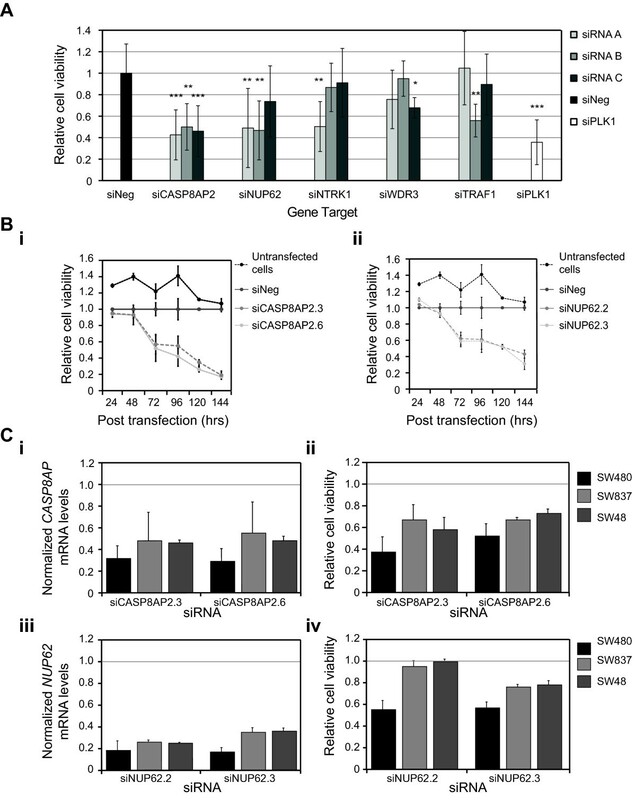 RNAi identifies CASP8AP2 / FLASH and NUP62 as essential for the viability of SW480 cells. (A) The relative viability of SW480 cells following transfection of three different siRNAs targeting each of the genes shown (see Methods for the identity of each siRNA). Data is shown as the mean ± SD of three independent transfections for each siRNA targeting the six genes of interest, normalized to the average viability of SW480 cells transfected with the negative control siRNA (siNeg; eight independent transfections). The normalized data for the positive control siRNA, siPLK1, (six independent transfections) is also shown. The statistical comparison (t-test of unequal variance) of siNeg transfected cells to cells transfected with the siRNAs corresponding to the stated genes is indicated by *** = p ≤ 0.001, ** = p ≤0.01, and * = p ≤0.05. (B) The effect of silencing (i) CASP8AP2/FLASH and (ii) NUP62, over 144 hours, on cell viability and their respective mRNA levels in SW480. The data shown represents the mean and standard deviation for three transfections per condition per time point normalized to the data from cells transfected with the negative control siRNA, siNeg. (C) The effect of silencing CASP8AP2/FLASH and NUP62 on their respective mRNA levels (i and iii) and on cell viability (ii and iv) in three SW480, SW837 and SW48 colorectal cancer cell lines. The data shown represents the mean and standard deviation for three transfections per condition per time point normalized to the data from cells transfected with the negative control siRNA, siNeg. As the silencing of CASP8AP2/FLASH showed the most consistent effect on the survival of CRC cells and has not been studied previously in the context of colorectal cancer we chose to examine this gene in further detail. CASP8AP2/FLASH was initially discovered as involved in the binding of the FAS-associated adaptor protein (FADD), and procaspase-8 . Ligand binding of FAS to the FAS cell surface receptor relays the extrinsic apoptotic death signal through recruitment of FADD, procaspase-8 activation, and formation of the death-inducing signaling complex (DISC). A number of studies have supported the interaction of CASP8AP2/FLASH with FADD and as a regulator for activation of CASPASE 8  and thus apoptosis . However, other studies have challenged the pro-apoptotic role of CASP8AP2/FLASH  and there is increasing evidence that the large CASP8AP2/FLASH protein (222 KDa) has multiple functions. A previous RNAi screen conducted in HeLa cells identified CASP8AP2/FLASH as essential for cell division  and other studies have linked it to NFκB signaling [20, 21], activation of MYB [22, 23], S-phase progression [24–26], and an involvement in histone biology. Evidence for the involvement of CASP8AP2/FLASH in histone biology includes its cellular location in nuclear organelles found adjacent to histone genes and biochemical studies linking it to histone transcript processing [24, 27–32]. Specific DNA and RNA based alterations are frequently associated with colorectal cancer. The examination of data obtained from colorectal cancer cell lines and primary tumors showed, however, no overt genomic or expression changes associated with the CASP8AP2/FLASH (Figure 2). The Chr. 6q15 region containing CASP8AP2/FLASH locus showed a reduction in copy number compared to normal colon mucosa in four out of five microsatellite-stable CRC cell lines (SW837, SW480, HT29, and Colo201) (Figure 2A). Only T84 showed a slight gain and a corresponding increase in mRNA expression compared to normal colon mucosa (~2-fold change) (Figure 2B). CAPS8AP2/FLASH expression is close to normal expression levels in HCT116 and LoVo cells and slightly increased (1.6 to 1.9-fold change relative to normal colon mucosa) in the other four cell lines (Figure 2B). Gene expression of CASP8AP2/FLASH is less than normal colon mucosa (0.7 linear fold change) in HT29 and SW837 cells, close to normal (1.1 to 1.2 linear fold change) in Colo201, SKCO1, and SW480 cells, and higher (> 1.3 linear fold change) in the remaining five cell lines (Figure 2B). CASP8AP2/FLASH protein expression has been shown to be higher in gastric carcinomas compared with normal tissues , however, expression of CASP8AP2/FLASH in 23 primary colon adenocarcinoma tumors showed levels close to that observed in normal colon mucosa (average linear fold change = 1.103, p = 0.48) (Figure 2C). Only two samples had expression ratios greater than 1.5, of which one had a linear fold change of 3.3 compared to normal mucosa. Molecular genomic characteristics of CASP8AP2 / FLASH in colorectal cancer cells and tumors. (A) The relative copy number of the CASP8AP2/FLASH loci and (B) the expression of CASP8AP2/FLASH mRNA in colorectal cell lines. All data is expressed as a linear fold change from that observed in normal mucosa. (C) The expression of CASP8AP2/FLASH in 23 primary tumor samples; data is expressed as linear fold change from that observed in normal mucosa. To begin to understand the functional processes underlying the decrease in the viability of CRC cells seen following silencing of CASP8AP2/FLASH we first assessed the effect of its LOF had on markers of apoptosis. CASP8AP2/FLASH was originally identified as a pro-apoptotic protein involved in FAS-mediated apoptosis. For example, a previous study showed FAS induced apoptosis was significantly reduced following the silencing of CASP8AP2/FLASH in HT1080 cells . We therefore hypothesized that, particularly in the absence of activation of FAS, silencing CASP8AP2/FLASH would have minimal effect on established markers of the apoptosis cascade. However, in SW480 cells, 48 hours following initiation of silencing of CASP8AP2/FLASH, activation of Caspase 8 was observed (Figure 3Ai; siCASP8AP2.3 p = 0.0002, siCASP8AP.6 p = 0.001); a significant activation of Caspase 8 was also observed 72 hours post siRNA transfection (Figure 3Bi siCASP8AP2.3 p = 0.02, siCASP8AP.6 p = 0.001. In addition, an activation of the downstream caspases, Caspase 3 and 7 was observed at both 48 and 72 hours post-siRNA transfection (Figure 3Aii and 3Bii; 48 hours, siCASP8AP2.3 p = 0.0008, siCASP8AP.6 p = 0.00001, 72 hours, siCASP8AP2.3 p = 0.001, siCASP8AP.6 p ≤0.00001). At 48 hours Caspase 8 and Caspase 3/7 levels were similar to that seen following silencing of a positive control, the Polo like kinase 1 gene, PLK1, whose inhibition is well known to activate apoptosis  and were greater than that seen in PLK1 silenced cells 72 hours post siRNA transfection. The silencing of CASP8AP2 / FLASH activates markers of apoptosis. The effect of silencing CASP8AP2/FLASH (two different siRNAs) for (A) 48 and (B) 72-hours on the levels of (i) activated Caspase 8, (ii) Caspase 3/7 and (iii) cell viability. The viability of cells transfected in parallel is shown for comparison and a siRNA corresponding to PLK1 was included as a positive control. Five independent transfections of each siRNA were performed. The statistical comparison (t-test, unequal) of siNeg transfected cells to CASP8AP2/FLASH, NUP62 or PLK1 silenced cells is indicated by *** = p ≤0.001, ** = p ≤0.01, and *. = p ≤0.05. Caspase 8 levels were measured using an Ac-LETD-pNA Caspase-8 substrate (Caspase-Glo 8 Assay, Promega), Caspase 3/7 levels were measured using a DEVD peptide substrate (Caspase-Glo 3/7 Assay, Promega), and cell viability was measured using Cell Titer Blue Reagent, Promega). The activation of markers of apoptosis can result from alterations in many different cellular processes. Further, because CASP8AP2/FLASH has been linked to multiple functions we chose to use a systems-wide unbiased approach to investigate the principal downstream effects that perturbation of CASP8AP2/FLASH function has on CRC cells. To investigate the systems-wide effects of CASP8AP2/FLASH LOF we conducted whole transcriptome microarray analysis of siRNA transfected SW480 cells using two different siRNAs. Differential expression following gene silencing was indicated by probes that showed a fold change in expression of > Log2 ± 0.6 (corresponding to a linear fold change of ~1.5), with a q-value (FDR) of < 0.05, for both siRNAs targeting CASP8AP2/FLASH. Overall, there was a high correlation in the fold change seen for those probes showing a significant fold change for both of the siRNAs (siCASP8AP2.3 vs. siCASP8AP2.6 r = 0.97). Only two probes showed a discordant change in the direction of the fold change seen with each siRNA (Additional file 6, Figure S2A), and only one potential off-target interaction within CASP8AP2/FLASH the expression profile was identified (Additional file 6, Figure S2B). The final gene expression profile, or RNAi signature, for CASP8AP2/FLASH consisted of over 3500 probes (approximately 2500 genes) (Figure 4A and Additional file 7, Table S5). The CASP8AP2 / FLASH RNAi signature. (A) Heat map representation of those genes showing a significant fold change (> ± 0.6 Log2 fold change, p < 0.05) 72 hours post transfection of two different siRNAs corresponding to CASP8AP2/FLASH. The 10 genes most altered in expression (up and down) following the silencing of CASP8AP2/FLASH are indicated. Median values are shown where multiple probes corresponding a specific gene were present. The probe corresponding to CASP8AP2/FLASH was the fourth most downregulated gene in the CASP8AP2 expression profile (ranked by changes mediated by siCASP8AP2.3 and then siCASP8AP2.6). The maximum fold changes in expression seen following the silencing of CASP8AP2/FLASH ranged from about a 2-fold linear decrease in expression to an over 20-fold increase in expression of over twenty genes. (B) The enrichment of functional ontologies for those genes upregulated following silencing of CASP8AP2/FLASH. No functional ontologies were significantly for those genes downregulated following CASP8AP2/FLASH loss of function. (C) Gene set enrichment analysis (GSEA) of the targets of transcription factors associated with CRC; (i) shows the overall statistical analysis for the enrichment of the targets within the CASP8AP2/FLASH RNAi signature for six transcription factors; NES refers to the normalized enrichment score, (ii) shows the enrichment plots for the targets of MYC and NFκB. We first examined genes related to the primary annotated function of CASP8AP2/FLASH in the regulation of the extrinsic apoptotic pathway. While we observed the functional activation of caspase proteins in SW480 cells following the silencing of CASP8AP2/FLASH, at a transcriptional level only CASP7 expression was increased (~2-fold linear increase). The extrinsic apoptotic associated proteins FAS and FASLG were both modestly upregulated at transcriptional level, but there was no other obvious link to this function of CASP8AP2/FLASH. Because of the lack of a clears association with changes in the expression of proteins associated with the extrinsic apoptotic we next looked for the enrichment of genes associated with specific functional ontologies so as to assess the broad biological processes perturbed as a result of CASP8AP2/FLASH LOF. No ontology categories where enriched within the genes that were downregulated following silencing of CASP8AP2/FLASH. Many ontologies were though associated with the genes that were upregulated following CASP8AP2/FLASH LOF, including the cancer, cellular growth and proliferation, cell death and gastrointestinal disease ontologies (Figure 4B and Additional file 8, Table S6). Genes associated with the cancer, cell growth and proliferation, and cell death ontologies, included the upregulation of several cyclin-dependent kinase inhibitors, specifically CDKN1A (p21; ~2.5-fold linear increase), CDKN1C (p57Kip2; ~5-fold linear increase), CDKN2B (p15; ~2-fold linear increase), and CDKN2D (p19; ~2-fold linear increase). These cyclin-dependent kinase inhibitors are all critical negative regulators of cell cycle. Their up-regulation following silencing of CASP8AP2/FLASH could therefore be of relevance to the reduction in cell viability observed in CASP8AP2/FLASH silenced CRC cells. As another approach to identify critical cellular networks perturbed as a result of CASP8AP2/FLASH LOF we used Gene Set Enrichment analysis (GSEA) to identify enrichment for the targets of specific transcription factors associated with CRC within the large CASP8AP2/FLASH RNAi signature. NFκB targets were significantly enriched within our list of genes upregulated after silencing of CASP8AP2/FLASH. Activation of NFκB is most frequently associated with an inhibition of apoptosis and constitutive activation of NFκB has been linked to CRC. Previous studies of CASP8AP2/FLASH function have shown that inhibition of CASP8AP2/FLASH expression suppressed TNFα induced activation of NFκB [20, 21]. Due to correction for multiple testing no specific canonical pathways were identified as perturbed by LOF of CASP8AP2/FLASH, but dense knowledge-based networks focused on TGFß, GRB2, and TNF were generated from the CASP8AP2/FLASH RNAi signature (Additional file 9, Figure S3). This TNF-centered network within the CASP8AP2/FLASH RNAi signature (Additional file 9, Figure S3, network 3) suggests that activation of TNF related signaling following silencing of CASP8AP2/FLASH may be contributing, at least in part, to the further up-regulation of the expression of NFκB target genes in SW480 cells. MYC, a well-known proto-oncogene, is critical to the proliferation and survival of many cancers . 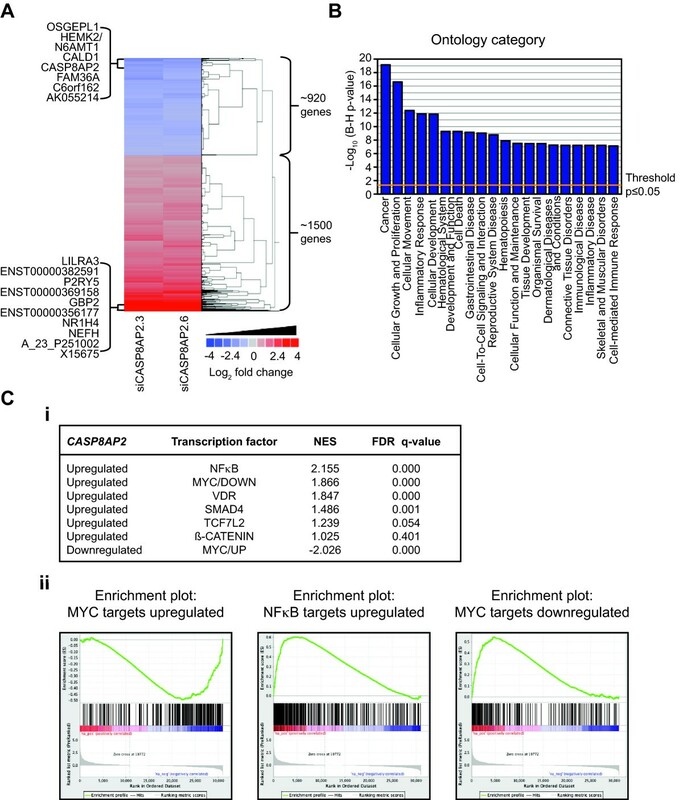 Genomic copy number gains of MYC is observed in some 50% of colorectal tumors and as a target of ß-catenin/TCF7L2 MYC expression is frequently deregulated in CRC . Deregulated MYC expression can lead to activation of some genes and repression of other. Interestingly, we observed that after CASP8AP2/FLASH LOF, genes that are activated by MYC were repressed, while conversely genes repressed by MYC were activated (Figure 4C). This indicates that the transcriptional activity of MYC is reduced in the absence of CASP8AP2/FLASH. CASP8AP2/FLASH LOF did not directly induce differential expression of MYC suggesting that this is a secondary effect perhaps as a result of changes in proteins responsible for the post-translational modification of MYC that also regulate MYC activity . The clearest LOF molecular phenotype that could be related to CASP8AP2/FLASH silencing was, however, alterations in the expression of the histone genes. The most intriguing aspect of the CASP8AP2/FLASH RNAi signature was the highly significant enrichment (normalized enrichment score = 2.53; FDR q-value < 0.001) for histone transcripts (Figure 5A). Of the approximately eighty genes encoding histone proteins, transcripts corresponding to over half of them showed altered levels compared to siNeg-transfected cells, in some cases exhibiting an over twenty-fold linear change in transcript levels (Table 1). Importantly, all histone transcripts showing a greater than two-fold change in mRNA levels were encoded by a subset of histone genes known as the replication-dependent histone genes. Histone proteins form a critical component of chromosome architecture and structural alterations. Principally, the acetylation and deacetylation of lysine residues on histone tails govern many important cellular functions, in particular transcription. Epigenetic modifications of histone proteins are frequently associated with changes in expression observed in many cancers. The majority of the canonical histone proteins are encoded by a family of over 60 replication-dependent histone genes, most found in clusters on Chromosomes 1 and 6 . The principal transcripts expressed from these genes are uniquely non-polyadenylated, containing instead an evolutionarily conserved 3' stem-loop sequence that is critical for regulating the expression and function of histone proteins. Two further histone transcripts expressed from genes outside of the main gene clusters can also generate non-polyadenylated mRNAs; the H2AFX gene that expresses the DNA damage associated histone protein, H2AX,  and the HIST4H4 gene . Expression of the mRNAs encoding the canonical histone proteins is tightly regulated; their expression is rapidly induced at the beginning of S phase, must remain high throughout S phase, and then is rapidly degraded at the end of S phase . The expression and processing of histone transcripts requires a unique set of proteins including nuclear protein ataxia telangietasia or NPAT protein, the U7 small nuclear RNA associated proteins LMS10 and LSM11, and the stem-loop binding protein, SLBP . A number of recent studies have also implicated CASP8AP2/FLASH in the processing of histone pre-mRNAs. CASP8AP2/FLASH has been detected in Cajal/Histone locus bodies (HLB) associated with NPAT and has been shown to functionally interact with LSM11 [24, 27–30]. The most recent of these studies showed that CASP8AP2/FLASH is required for the endonucleolytic cleavage of histone pre-mRNAs . Loss of CASP8AP2 / FLASH function induces changes in the expression of the replication dependent histone genes. (A) The CASP8AP2/FLASH RNAi signature was subjected to gene set enrichment analysis for 79 annotated human histone genes. A very high positive correlation was observed indicating a significant enrichment (Normalized enrichment score = 2.53; FDR q-value < 0.001) for deregulation of transcript levels of the human histone genes following silencing of CASP8AP2/FLASH. (B) Diagrammatic representation of the two annotated transcript variants of HIST1H2BD and the relative positions of PCR primers used in this study. The primers for the HIST1H2BD variant, NM_138720, were designed to flank a known splice site within this transcript so is its expression could be assessed by qRT-PCR without the risk of amplifying genomic DNA. (C) RT-PCR quantification of changes in (i) CASP8AP2/FLASH and (ii) HIST1H2BD expression using cDNA generated using random hexamer priming. (D) RT-PCR quantification of changes in CASP8AP2/FLASH and HIST1H2BD expression following silencing of CASP8AP2/FLASH. RNA was harvested 72 hours after silencing of CASP8AP2/FLASH and cDNA generated using either (i) random hexamers or (ii) oligo dT. Data is shown as the median of two independent cDNA syntheses and two independent PCR reactions per cDNA synthesis. It is important to note that the cRNA used in this study was generated using an oligo dT primer, selective for polyadenylated transcripts, and thus the changes in the levels of the replication dependent histone transcripts would appear to reflect significant alterations in the levels of the less well defined polyadenylated versions of these histone transcripts. The detection of polyadenylated replication-dependent histone transcripts has been noted previously following silencing in HeLa cells of two other replication dependent histone 3' end processing proteins: negative elongation factor (NELF) and the cap binding complex (CBC) . Following silencing of either NELF or CBC, Nariata and co-workers, reported increases in the levels of twelve histone genes by array analysis, also following oligo dT primer selection. Examination of the expression of two of these histone genes, HIST1HC and HIST2H2AA, in detail confirmed that this result was due to the induction of the expression of polyadenylated transcript variants corresponding to these genes . In SW480 cells we also detected enhanced levels of a putative polyA HIST1HC transcript and most of the other histone genes observed by Narita and co-workers to express polyA variants following silencing of NELF or CBC (Table 1). Further, recent next generation sequencing of RNA polyadenylation has revealed the presence of polyadenylation of over twenty replication dependent histone mRNAs in unperturbed HeLa cells . In an unperturbed state the polyA histone transcripts represented ~4% of the total amount of transcription from the replication dependent histone genes. Of the over twenty histone transcripts with polyA variants detected by sequencing, we detected putative polyA versions corresponding to fifteen of these genes following CASP8AP2/FLASH LOF (Table 1). To confirm that the CASP8AP2/FLASH LOF leads to the induction or enhanced presence of the non-canonical, polyadenylated transcript variants of the replication-dependent histone genes we examined by qRT-PCR the expression of one replication-dependent histone gene HIST1H2BD. Unlike most replication-dependent histone genes where only the non-polyA transcript has been annotated as having a consensus reference sequence, two annotated transcript variants have been reported for HIST1H2BD; NM_021063, the non-polyA transcript variant and NM_138720 the polyadenylated variant (Figure 5B). Using cDNA primed with either random hexamers (Figure 5C) or oligo dT primers (Figure 5D) and primers specific for the canonical non-polyA and the poly A transcript variants (Figure 5B) we observed that following silencing of CAPS8AP2/FLASH (Figure 5Ci and 5Di) only the levels of the polyadenylated variant NM_138720 of HIST1H2BD were increased. No significant change was seen in the levels of the NM_021603/HIST1H2BD non-polyA variant (Figure 5Cii) when primed using random hexamers. To corroborate and extend our study of the very extensive changes in expression seen following CASP8AP2/FLASH LOF we conducted further whole transcriptome expression assays as this platform enabled us to continue to probe in an unbiased and systematic fashion the diverse functional consequence of silencing CASP8AP2/FLASH we had observed. To further ensure the specificity of the effects seen following CASP8AP2/FLASH silencing we used an additional siRNA (siCASP8AP2.1) and also included arrays from untransfected SW480 cells. Importantly, to gain additional insight into the temporal effects on the transcriptome following CASP8AP2/FLASH LOF we assessed effects over a time course of 10, 24, 48, and 72 hours post siRNA transfection (see Additional file 10, Figure S4 for further details). At 72 hours all three CASP8AP2/FLASH siRNAs induced a significant change (Log2 > ± 0.6, q-value < 0.05) in over 2,800 probes (~2300 genes) (Figure 6A, Additional file 11, Table S7). Tracking the expression of these genes over time showed many were also changed at 48 hours, and in some cases even at 24 hours (Figure 6A, Additional file 11, Table S7). In most cases the direction of change seen at the earlier time points were maintained at 72 hours. All of the gene ontology categories enriched in the initial 72 hour CASP8AP2/FLASH RNAi signature were also enriched in the follow up study at both the 48 and 72 hour time points (Figure 6B and Additional file 8, Table S6) further confirming the broad but specific effects the CASP8AP2/FLASH LOF has on SW480 cells. Using GSEA we confirmed the significant enrichment for changes in the levels of histone transcripts at 24, 48, and 72 hours (Figure 6C). At just 24 hours after silencing of CASP8AP2/FLASH the majority of probes indicating a significant change in the expression (q < 0.05) corresponded to the replication dependent histone proteins (Additional file 12 Table S8). At 72 hours post CASP8AP2/FLASH siRNA transfection we detected almost exactly the same complement of histone genes showing expression of the polyA variant as seen previously (Additional file 12, Table S8). All of the histone genes noted by Narita and co-workers as expressing polyA variants following silencing of NELF or CBC were again changed following CASP8PA2/FLASH (Additional file 12, Table S8). Two further polyA variant transcripts noted by Shepard and co-workers  were also now detected in CASP8PA2/FLASH silenced cells (Additional file 12, Table S8). The vast majority of the transcripts corresponding to replication dependent histones showed an increase in levels following silencing of CASP8AP2/FLASH confirming that the inhibition of the function of proteins required for the canonical processing of histone transcripts predominately leads to the induction and/or accumulation of polyadenylated histone transcripts. Future studies will be required to determine the exact mechanism underlying the generation of these non-canonical transcripts. Interestingly, the probes corresponding to a very limited number of histone transcripts including HIST1H1B and HIST1H4L consistently detected a decrease in expression (Table 1 and Additional file 12, Table S8) following silencing of CASP8AP2/FLASH. Further studies will be needed to investigate this, and also the effect these changes in the expression of the replication-dependent histone genes has on the production of the replication-dependent histone proteins and thus on overall chromatin architecture, however our data suggests that CASP8AP2/FLASH LOF leads to highly reproducible and specific changes on the transcriptome. The loss of CASP8AP2 / FLASH function induces consistent effects on the transcriptome of CRC cells. (A) Heat map representation of the median fold change for those transcripts showing a significant fold change (> ± 0.6 Log2 fold change, p < 0.05) at 72 hours post-transfection for all three siRNAs corresponding to CASP8AP2/FLASH when compared to the expression profiles obtained for siNeg transfected SW480 cells generated at the same time points. Data at earlier time points reflects the fold changes seen for all of these transcripts, though these changes in expression may have not reached significance. (B) The enrichment of functional ontologies for upregulated genes with the CASP8AP2/FLASH RNAi signatures obtained 48 and 72 hours post siRNA transfection. No statistically significant enrichment was seen for genes showing a downregulation in expression within the CASP8AP2/FLASH RNAi signature. (C) Gene set enrichment analysis of the human histone genes at 10, 24, 48 and 72 hours. (D and E) Gene set enrichment analysis of the targets of transcription factors associated with CRC. (D) Shows the overall statistical analysis for the enrichment of the targets within the CASP8AP2/FLASH RNAi signature for six transcription factors, (E)(i) shows the enrichment plots for the targets of NFκB over time, (ii) shows the enrichment plots for the upregulated targets of the MYC transcription factor over time, and (iii) shows the enrichment plots for the downregulated targets of the MYC transcription factor over time. Complementary to our original data, NFκB transcriptional targets were once again significantly enriched within the upregulated portion of the CASP8AP2/FLASH signature at 24, 48, and 72 hours post-silencing (GSEA FDR q-values of 0.036, < 0.001, and < 0.001 respectively) (Figure 6D and 6Ei). We had anticipated that the time course data could be used to identify drivers of this transcriptional response, however, though TNF-centered knowledge based networks could be generated from the CASP8AP2/FLASH RNAi signature (Additional file 13, Figure S5) there was limited overlap between the specific genes that formed these networks and those obtained previously (Additional 8, Figure S3). We also confirmed that gene targets activated by MYC were downregulated at 24, 48, and 72 hours (all FDR q-values of < 0.001), and genes known to be suppressed by MYC were upregulated at the same time points (GSEA FDR q-values of 0.014, < 0.001, and < 0.001 at 24, 48 and 72 hours respectively) (Figure 6D and 6Eii and iii). While it is clear that transcriptional activity of MYC is reduced, we have been unable to identify upstream mediators that link these transcriptional changes to CASP8AP2/FLASH loss-of-function. Further work will thus be required to identify the specific signaling processes connecting CASP8AP2/FLASH silencing to alterations in these transcriptional networks. All of the cyclin dependent kinase inhibitor genes identified as upregulated following CASP8AP2/FLASH silencing previously were once again upregulated, with CDKN1C (p57Kip2) once more showing the greatest change. Forty-eight hours post CASP8AP2/FLASH silencing CDKN1C/p57Kip2 mRNA levels increased ~ 4 linear fold, and this was further enhanced by 72 hours post siRNA transfection when its levels were increased by over 6 linear fold. Interestingly, one study of the expression of CDKN1C/p57Kip2 observed decreased immunostaining in colorectal carcinomas , and in our colorectal cell lines and tumor samples we saw significant reduction in expression (CDKN1C/p57Kip2 expression in CRC cell lines versus normal mucosa mean linear = 0.17 (p < 0.00098) and primary colon tumor versus normal mucosa mean linear ratio = 0.15 (p < 0.0026)). Altered expression of CDKN1C/p57/Kip2 has been noted in several cancer types, frequently as a result of epigenetic changes leading to speculation that it may act as a tumor suppressor . It will interesting to determine in the future if any of the alterations in histone gene transcription observed following the silencing of CASP8AP2/FLASH modulates the expression of epigentically regulated genes such as CDKN1C/p57Kip2. It will also be important in future studies to determine if CASP8AP2/FLASH LOF induces similar effects in other colorectal cancer cell lines and in other cancer cell types. The most significantly upregulated annotated gene following CASP8AP2/FLASH loss-of-function was NEFH, which was upregulated more than 40 linear fold following the silencing of CASP8AP2/FLASH. This gene encodes the neurofilament heavy polypetide (Figure 7A). Recently, it has been shown that the NEFH gene is methylated in esophageal squamous cell carcinoma (ESCC) and that the inhibition of NEFH expression in ESCC leads to activation of both the AKT and ß-catenin/TCF7L2 pathways . Our time course experiment shows that the up-regulation of NEFH occurs between 24 and 48 hours after initiation of the silencing of CASP8AP2/FLASH (Figure 7B). To assess if CASP8AP2/FLASH LOF increases the level of NEFH at a protein level we performed Western blot analysis following silencing of CASP8AP2/FLASH (Figure 7C). Duplicate samples were also assessed by qRT-PCR for mRNA reduction: siCASP8AP2.3 and siCASP8AP2.6 reduced CASP8AP2/FLASH transcript levels by 63% and 77%, respectively. Western blot analysis showed a clear induction of NEFH following inhibition of CASP8AP2/FLASH. The gene expression data for NEFH for CRC cell lines and primary tissues compared to the expression in normal colon mucosa showed this gene is significantly reduced in expression (Figure 7D; p < 2.1 × 10-13 in cell lines and p < 9.6 × 10-13 in tumors). Given that NEFH may function as a tumor suppressor in ESCC  it will be interesting to determine if it performs a similar role in colorectal cancer. Ectopic expression of NEFH has been linked to suppression of targets of the ß-catenin/TCF7L2 signaling . While we saw no statistically significant evidence of repression of the ß-catenin pathway within the CASP8AP2/FLASH RNAi signature (Figures 3C and 4D) it is should be noted that CTNNB1 transcript levels were somewhat reduced (~2 linear fold change) at both 48 and 72 hours post CASP8AP2 siRNA transfection. Also, one of the most significantly downregulated genes following silencing of CASP8AP2/FLASH was NOTUM (Exp 1: 72 hours, siCASP8AP.3, 3.1 linear fold decrease, p = 0.001; siCASP8AP.6, 3.7 linear fold decrease p = 0.0002; Exp. 2: median fold change 48 hrs: 3.5 linear fold decrease, p = 0.0032; 72 hrs: 4.4 linear fold decrease, p = 0.0002). NOTUM, best characterized in Drosophila as regulated by Wingless, has recently been identified as a direct target of the ß-catenin/TCF7L2 that is overexpressed in hepatocellular carcinoma (HCC) . This same study noted over expression of NOTUM in SW480 cells and in pooled sample of three colorectal tumors. We have also observed increased expression of NOTUM in SW480 cells (18.3-fold increase relative to normal mucosa) and over 75% of primary colon adenocarcinomas (18/23) showed a 2 linear fold or greater overexpression of NOTUM. Further studies will be required, but this may suggest, that NOTUM, as in HCC, is a target of the frequently activated ß-catenin/TCF7L2 pathway observed in CRC. 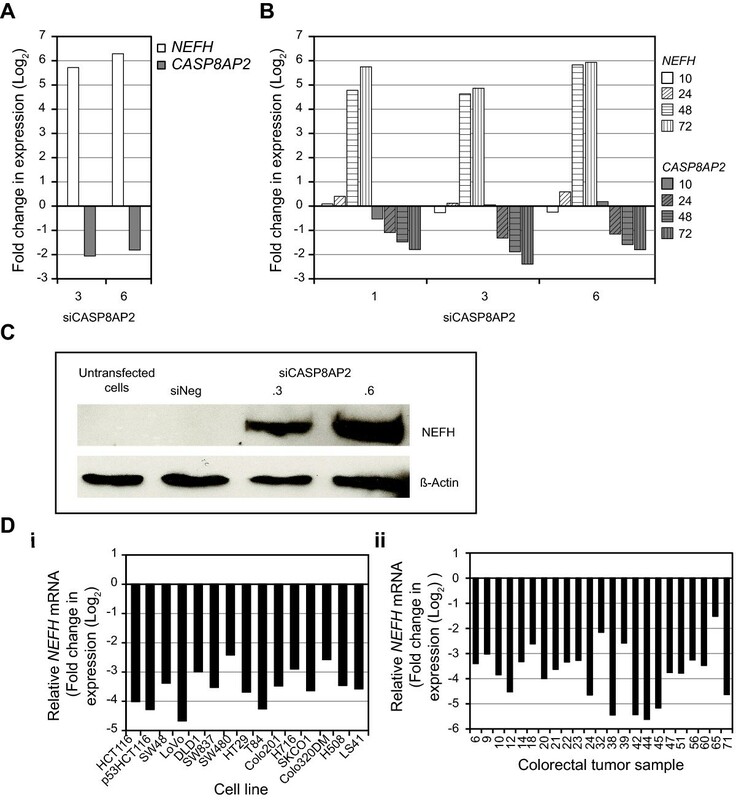 Loss of function of CASP8AP2 / FLASH induces expression of NEFH. (A) The expression of NEFH 72 hours following silencing of CASP8AP2/FLASH (2 different siRNAs) as measured by microarray analysis. (B) The expression of NEFH at 10, 24, 48 and 72 hours following silencing of CASP8AP2/FLASH (three different siRNAs) as measured by microarray analysis. (C) Western blot analysis shows increased abundance of NEFH protein 72 hours after silencing of CASP8AP2/FLASH. (D) Molecular characteristics of NEFH in colorectal cell lines and primary tumors. (i) The expression of NEFH mRNA in colorectal cell lines. All data is expressed as Log2 fold change from that observed in normal mucosa sample. (ii) The expression of NEFH in 28 primary tumor samples. All data is expressed as Log2 fold change from that observed in normal mucosa sample. We have identified Caspase-8-Associated protein 2/FLICE-associated huge protein (CASP8AP2/FLASH) as essential for the survival of colorectal cancer cells. Contrary to what would perhaps be expected given its principle annotated function as a pro-apoptotic factor required for activation of the extrinsic apoptotic pathway, we observed, in the absence of FAS stimulation, significant activation of both Caspase 8 and Caspase 3/7 following inhibition of CASP8AP2/FLASH function. Instead, systems-wide analysis of the LOF of CASP8AP2/FLASH confirmed and extended biochemical studies showing that CASP8AP2/FLASH has a critical role in regulating the expression of the replication-dependent histone genes. 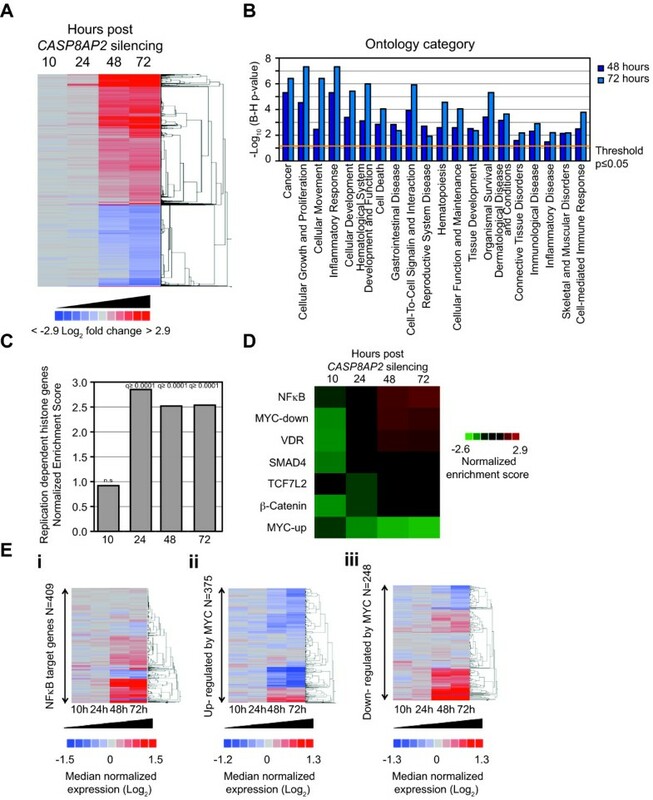 The observation that the expression levels CASP8AP2/FLASH are the same in normal and colorectal cancer tissue also suggests a role in normal homeostasis for this protein as would be expected if its primary role is in regulating the expression of the replication-dependent histone genes. Also by using an unbiased, whole transcriptome approach we were able to identify that additional downstream effects of CASP8AP2/FLASH LOF included enhanced expression of genes targeted by NFκB and evidence of decreased MYC activity. Finally, silencing of CASP8AP2/FLASH led to expression of a recently identified tumor suppressor gene NEFH. 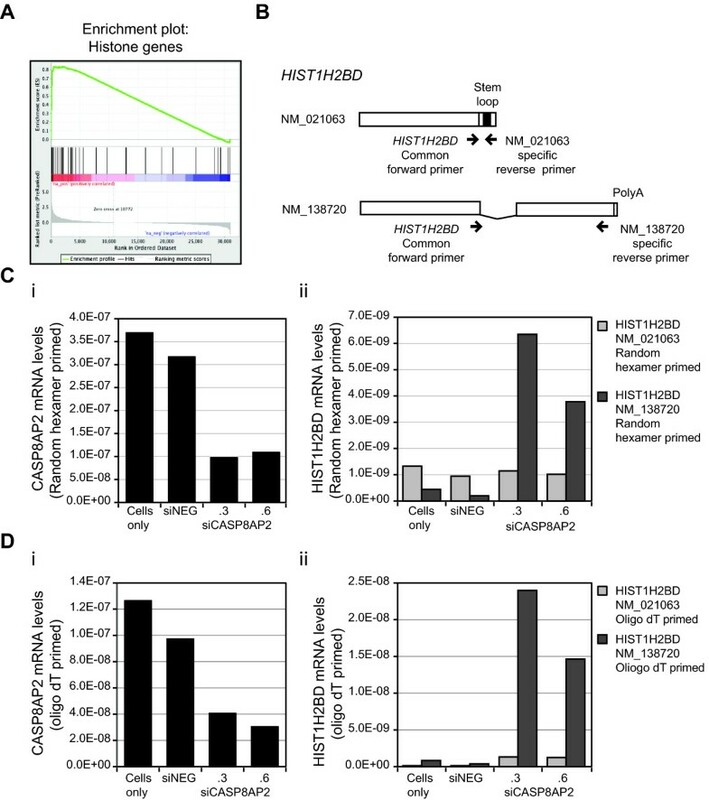 NEFH has been shown to be the subject of epigenetic modification, as too has another gene upregulated following CASP8AP2/FLASH silencing, CDKNIC/p57. It is our current hypothesis that the changes in the expression of these genes following silencing of CASP8AP2/FLASH is likely an indirect effect; it could be that these genes are the target of one or more of the transcription factors that we see target enrichment for within the CASP8AP2/FLASH RNAi signature, or it may be that changes in the processing of the transcripts corresponding to the replication dependent histone transcripts is altering expression more broadly. This research was supported by the Intramural Research Program of the NIH, National Cancer Institute, Center for Cancer Research. ABH was supported in part by a Sallie Rosen Kaplen Fellowship from the NCI. We thank Danny Wangsa, Hesed Padilla-Nash, Chanelle Case and Sudhir Varma for technical assistance.